Nowhere has there been a better opportunity for a little competitive sibling bonding time than what Jarrod “Bluto” Allen and his brother Jacob “Apollo” Allen experienced recently during exercise Max Thunder in South Korea. Because they just flew alongside one another in a giant aerial war game. Although both Allen brothers are fighter pilots, Jarrod flies the F/A-18D with Marine Fighter Attack Squadron 225, nicknamed the “Vikings,” and Jacob is an Air Force F-16CM pilot with the 35th Fighter Squadron, known as the “Pantons.” Both grew up around the air combat business, with their dad being a Navy E-2 Hawkeye crewman, which resulted in the brothers attending countless air shows and military aviation events when they were young. Although they could talk a lot about their common trade, they had never had an opportunity to see each other in action on common ground, or rather, in common airspace. That is, until they were both deployed to Gwangju Air Base for the biannual Max Thunder combat drill, the largest of its kind in South Korea. 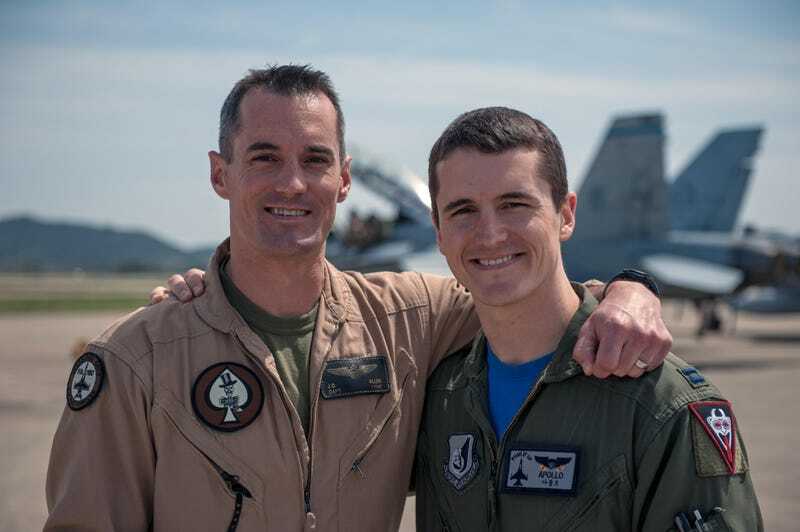 A series of unique assignments brought the two flying and fighting siblings together, with Jarrod being deployed from his home station at MCAS Miramar to MCAS Iwakuni, Japan as part of a routine Marine Corps F/A-18 squadron rotation there. Jacob is a front-line F-16 driver stationed at Kunsan Air Base in South Korea. This close proximity brought the pair together for Max Thunder 2015. On the very first night of the exercise both brothers were assigned the defensive counter-air mission. Jacob led the first division of jets, made up of four aircraft, on a combat air patrol to defend an assigned area. Once their on-station time was ending, the second division came into the airspace to relieve them. The last time the brothers ran into each other in the field was for a brief period in Jordan, but they didn’t have the chance to fly together like they did during Max Thunder ‘15. Although both brothers fly dissimilar aircraft, they have similar missions, with the Marine’s Hornet force being more focused on close air support than the USAF’s equally as multi-role F-16 force. Yet both sub-types, the F/A-18D and the F-16CM, are especially optimized for all weather, night strike missions.